Expolanka Freight Ltd. was recognised for its supply chain solution management and delivery excellence in addition to its ability to meet demanding project deadlines in a timely and flexible manner at the Huawei Annual Core Partner Convention 2018 held in New Delhi, India. EFL was invited to the conference as Huawei’s only logistics partner from Sri Lanka. The Silver Delivery Excellence Award was presented to EFL for what Huawei described as EFL’s ability to keep promises on service delivery, and provide immediate support during difficult or unexpected situations. 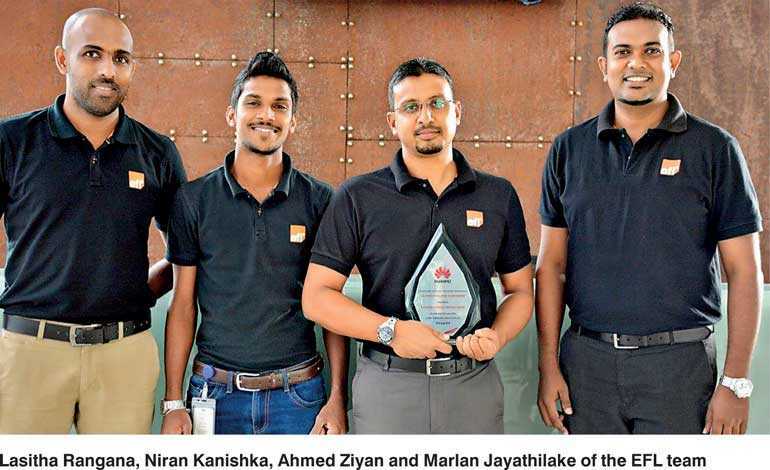 The company’s Sri Lanka Procurement Qualification Division and Supply Chain Business Department (both South East Asia Region) were praised in particular for their support to suppliers in building long term business partnerships. The awards ceremony was attended by Huawei’s senior management, including CEO for the India operations and Directors and other Regional senior management of Huawei. The conference was attended by 250-300 guests representing the supplier and partner network from India, Nepal and Sri Lanka. Presentations made during the event focused primarily on Huawei’s overall business growth, future plans and expectations from suppliers on this growth path. Expolanka’s partnership with Huawei covers customs clearance, warehouse and inventory management, site delivery and re-exports for the company. The criteria for the Delivery Excellence award included partners’ ability to provide timely and flexible service to meet demanding, tight deadlines. The quarterly supplier ratings were also incorporated into the criteria. Expolanka has led the charge in key areas of supply chain management in Sri Lanka, in particular with the provision of services such as freeport solutions. The award is testament to the company’s continuous enhancement of service delivery, securing its position in the market as a reliable end to end supply chain provider.